Welcome back for Day 22 of our 31 Days of Horror series! Today, we’re closing out the 1980s with David Cronenberg’s 1986 remake of The Fly. Jeff Goldblum and Geena Davis star in this one, and I’ll go ahead and preface my review by saying that I have not seen the original version from the ’50s. Therefore, this won’t be a comparison between the two, and any thoughts regarding the 1986 version won’t reflect positive or negative changes from the other. With that said, I enjoyed this movie. 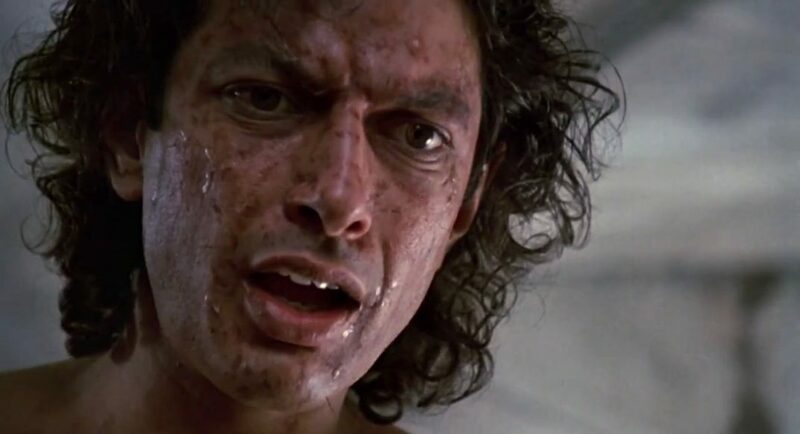 Jeff Goldblum was a great choice to play Seth Brundle, as he fits the nerdy-but-lovable scientist mold quite well. I guess I’d never seen him in anything as early as this, though, because I had no idea his teeth were so weird. He must have had them fixed afterward, but in this movie they lend even more of a fly-like quality to pre-Brundlefly Goldblum. Seth Brundle is working to pioneer a scientific concept that he believes will change the world as we know it: teleportation. He has managed to procure funding for his laboratory and experiments, but his benefactors don’t fully know what he is up to. He wants to perfect the process first, then blow the lid off the scientific community with his model of disintegration/reintegration. At first, Brundle is only able to transport inanimate objects within his pod system, but the tables turn when he meets saucy journalist, Veronica (Geena Davis). The two are instantly swept up in a whirlwind romance (complete with awkward comments about being “driven crazy” by flesh, which somehow provide Brundle with a Eureka moment as to how he might begin to teleport living matter). Trouble brews in paradise, however, when inappropriate interferences from Veronica’s boss cause Brundle to become jealous and doubt her commitment. He attempts to drown his sorrows in champagne one night, and, awash in self-pity and lowered inhibitions, he steps into the teleportation pod himself. Unfortunately for Brundle, a fly also sneaks into the pod without his knowledge, and the computer system mistakenly fuses their DNA. As the rest of the film unfolds, strange physical and psychological changes start to overtake Brundle, and he becomes a horrifying hybrid between man and fly. This movie has a much stronger first half than second; once Brundle plunges into the more gruesome aspects of fly fusion, things start to go off the rails for me. Personally, I wish he had either turned into MORE of a fly, or less of one. As it is, Brundle just looks like a gooey burn victim (with shades of The Thing from Fantastic Four). He does have the course insect hairs sprouting from various parts of his body, and he does use the disgusting acid-vomit thing to break down his “food”…but aside from that, there isn’t much to distinguish him as a fly. He doesn’t have wings, he doesn’t have kaleidoscope eyes–he just looks gross. Cronenberg IS known for embracing weirdness and going down questionable roads in his movies, so maybe that was what he was trying to do here. Who knows. Either way, I feel like the transformation scenes could have been a little more successful, and I really don’t like the Lifetime-esque, “I’m pregnant with a monster’s baby!” angle that they force into the ending. It’s just too much. Overall, I’d call this a decent movie that could have been better. It makes me want to go back and watch Vincent Price’s original version, and see how the two stack up. I do think a lot of the elements Cronenberg employs in this version could/would not have been used in the ’50s, so I’m curious as to how they might differ. One way to find out! Tomorrow, join me again as I review Bernard Rose’s Candyman (1992) to kick off the 1990s. If you haven’t already, be sure to go back and catch up on any 31 Days of Horror reviews that you might have missed, and keep on comin’ back for more as we head into the last leg of October!! Very well written Kelley! Loved watching the movie with you guys! Now it is Alabama Football time. I want a picture of you and Zac drinking from our Alabama National Championship glasses to post on Facebook for the family….lol! Hopefully, I will be able to eat and enjoy the shrimp and okra gumbo….kind of nervous. Gonna be a close one!